TRIAL International operates in numerous countries where the judicial system is unwilling or unable to prosecute the perpetrators of atrocities. The very scale of the crimes that we are fighting means that the victims are in their thousands. TRIAL cannot accomplish this titanic task alone: collaboration with local actors is essential to ensure the quality and, above all, the sustainability of the work. That is why TRIAL International offers unique training for actors engaged in the fight against impunity in every country where it intervenes: lawyers, prosecutors, journalists, NGO members, etc. The aim of such training is to raise these actors’ awareness of victims’ rights and needs, and to share with them the best legal practices to curb impunity. 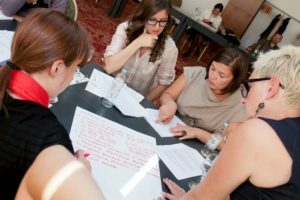 How to conduct interviews with victims who may be highly traumatized; how to bring cases before a regional or international jurisdiction; how to ensure the confidentiality of a case and the safety of human rights defenders: These are only some of the issues the trainees learn to address. TRIAL International pays particular attention to the fact that its training takes place in a variety of geographical and cultural contexts. Each training course is therefore adapted to the place where it is delivered in order to ensure that it is as close as possible to local issues. Sessions are organized in an interactive manner, bringing together theory, specific cases and opportunities to exchange ideas. Considerable emphasis is placed on feedback and experiences of the participants who, as human rights practitioners, have an excellent knowledge of the field. Thus, each participant can share his or her experiences and foster reflection among the other participants and the trainer. TRIAL International’s training is therefore not unidirectional; it enriches everyone’s knowledge. On completion of a training course, participants will possess new working tools to fight impunity more effectively. Once trained, participants can pass their knowledge onto their peers, thereby creating a climate of positive emulation. An additional goal is to strengthen ties between human rights defenders at local and regional levels.